Flucytosine, a fluorinated pyrimidine analog, is a synthetic antifungal agent. Oral flucytosine is used for the treatment of serious infections caused by susceptible strains of Candida or Cryptococcus neoformans and for the treatment of chromomycosis (chromoblastomycosis) caused by susceptible fungi. While flucytosine may be effective when used alone for the treatment of some fungal infections (e.g., candidal cystitis, chromomycosis), the drug should not be used alone in the treatment of severe, life-threatening infections. In the treatment of serious candidal or cryptococcal infections, flucytosine generally has been used as an adjunct to IV amphotericin B or an azole antifungal agent (e.g., fluconazole, itraconazole). Use of flucytosine in conjunction with amphotericin B or an azole antifungal agent is based on the in vitro and in vivo synergistic effects reported with these drugs (see Drug Interactions); however, the benefits of concomitant therapy versus use of IV amphotericin B or an azole antifungal agent alone in patients with severe candidal or cryptococcal infections are unclear since the regimens have not been evaluated in well-designed, controlled studies. There is some evidence that combined use of flucytosine and amphotericin B may be associated with an increased risk of serious adverse effects, especially in immunocompromised patients including those with human immunodeficiency virus (HIV) infection. To reduce the risk of toxicity when flucytosine is used concomitantly with another antifungal agent, flucytosine dosage should be carefully adjusted based on serum concentrations of the drug and patients receiving such therapy should be monitored closely for adverse effects. In addition, because of concerns related to intrinsic resistance or emergence of resistance to flucytosine, it has been recommended that in vitro susceptibility tests be performed prior to and during flucytosine therapy whenever available. Oral flucytosine usually is used in conjunction with IV amphotericin B for the treatment of serious infections caused by susceptible strains of Candida, including urinary tract or pulmonary infections, candidemia, endocarditis, and meningitis. In addition, oral flucytosine has been used in conjunction with oral itraconazole for the treatment of esophageal candidiasis in a limited number of HIV-infected patients. While IV amphotericin B usually is considered the drug of choice for the initial treatment of severe candidal infections (e.g., candidemia in neutropenic or nonneutropenic patients who are clinically unstable or have evidence of deep-organ involvement, CNS infections, chronic disseminated candidiasis [hepatosplenic candidiasis]), some clinicians suggest that the response rate to IV amphotericin B may be improved if flucytosine is administered concomitantly (especially in neutropenic patients or patients with C. tropicalis infections). Flucytosine has been used orally or topically in the treatment of ophthalmic infections caused by Candida. While a regimen of oral fluconazole (with or without oral flucytosine) also has been used and is been recommended by some clinicians for the treatment of uncomplicated candidal endophthalmitis, a regimen of IV amphotericin B (with or without oral flucytosine) is recommended by some clinicians for the treatment candidal endophthalmitis when lesions are advancing rapidly or threaten the macula. For the treatment of keratitis caused by Candida, some clinicians suggest that flucytosine be administered topically as a 1% solution (prepared by dissolving the contents of a commercially available flucytosine capsule in artificial tears and filtering the solution); efficacy of subconjunctival injection of flucytosine in these infections has not been established. Oral flucytosine usually is used in conjunction with IV amphotericin B for the treatment of serious cryptococcal infections, including pulmonary infections, septicemia, and meningitis. Because of reported in vitro and in vivo synergism, many clinicians advocate concomitant use of amphotericin B and flucytosine for the initial treatment of most cryptococcal infections, especially cryptococcal meningitis in HIV-infected patients. Addition of flucytosine to the regimen may reduce the time required for sterilization of CSF in those with CNS involvement, but may not improve clinical outcome in all patients. Because flucytosine often is poorly tolerated in HIV-infected patients, it has been recommended that combination therapy be used only until the patient is stabilized and that serum flucytosine and blood cell counts be closely monitored. Many clinicians now recommend that treatment of cryptococcal meningitis in HIV-infected patients be initiated with a regimen of IV amphotericin B (with flucytosine) given for at least 2 weeks (or until the patient’s condition is stabilized) followed by a regimen of oral fluconazole or oral itraconazole administered for at least an additional 8-10 weeks or longer. A regimen of oral fluconazole (400-800 mg daily) and oral flucytosine (100-150 mg/kg daily) has been used as an alternative regimen for the treatment of pulmonary or CNS cryptococcal infections in a limited number of patients. Although fluconazole used in conjunction with flucytosine may be effective for the treatment of mild to moderate pulmonary cryptococcal infections, this regimen has been ineffective in some patients with cryptococcal meningitis and is not recommended for initial treatment of such infections. In addition, when used for the treatment of cryptococcal meningitis in HIV-infected individuals, a regimen of fluconazole and flucytosine has been associated with a high incidence of adverse effects resulting in discontinuance of flucytosine in about 28% of patients. Oral flucytosine has been used alone or in conjunction with another antifungal agent (e.g., IV amphotericin B, oral itraconazole, oral ketoconazole) for the treatment of chromomycosis (chromoblastomycosis) caused by various dematiaceous fungi (e.g., Cladosporium, Exophiala, Phialophora). Optimum treatment of chromomycosis has not been identified. Because many of the causative organisms are resistant to amphotericin B in vitro but may be susceptible to flucytosine, flucytosine generally has been considered a drug of choice for the treatment of chromomycosis. Infections caused by Exophiala castellanii have been effectively treated with a regimen of IV amphotericin B and oral flucytosine; a regimen of oral itraconazole and oral flucytosine was effective in at least one patient with infection caused by E. spinifera. In some patients with invasive aspergillosis (e.g., CNS, endocarditis), IV amphotericin B has been used concomitantly with oral flucytosine; however, it is unclear whether the combination regimen offers any benefit over use of amphotericin B alone and there are concerns related to an increased incidence of adverse effects with the combination. Oral flucytosine has been used in conjunction with IV amphotericin B for the treatment of meningitis caused by Sporothrix schenckii. For the treatment of keratitis caused by Aspergillus, Cladosporium, or Penicillium, some clinicians have suggested that flucytosine be administered locally as a 1% topical solution; however, efficacy of such therapy has not been established. Flucytosine is administered orally. Flucytosine also is administered IV; however, a parenteral dosage form of the drug is not commercially available in the US. The incidence and severity of nausea or vomiting may be decreased or eliminated if each dose of oral flucytosine is administered by ingesting the capsules a few at a time over a 15-minute period. The usual dosage of flucytosine for adults or pediatric patients is 50-150 mg/kg daily, administered in 4 equally divided doses at 6-hour intervals. Because prolonged serum flucytosine concentrations exceeding 100 mcg/mL may be associated with an increased risk of toxicity (e.g., adverse hematologic, GI, and hepatic effects), most clinicians recommend that flucytosine dosage be adjusted to ensure that serum concentrations of the drug remain below 100 mcg/mL. While some clinicians suggest that peak flucytosine serum concentrations should be 50-100 mcg/mL, most recommend that serum concentrations of the drug be maintained at 25-80 mcg/mL. Adjusting flucytosine dosage to maintain peak serum concentrations of 40-60 mcg/mL may provide a good balance between antifungal activity and risk of toxicity and allows a margin of safety for patients who may experience changes in renal function It has been suggested that serum specimens for determining flucytosine concentrations should be obtained 30-60 minutes or 2 hours after an oral dose of the drug. 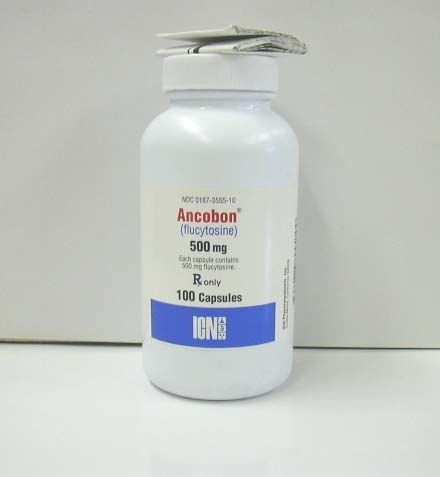 When used in conjunction with another antifungal agent (e.g., IV amphotericin B, fluconazole, itraconazole) for the treatment of severe candidal or cryptococcal infections, flucytosine usually has been administered in a dosage of 100-150 mg/kg daily. To reduce the risk of toxicity in patients receiving flucytosine concomitantly with IV amphotericin B, especially in HIV-infected patients, some clinicians suggest that flucytosine therapy be initiated in these patients using a slightly lower dosage (i.e., 75-100 mg/kg daily given in 4 divided doses). Dosage can then be adjusted based on serum concentrations of flucytosine and the presence or absence of amphotericin B-associated renal toxicity. For the treatment of cryptococcal meningitis in individuals with or without HIV infection, many clinicians recommend an initial regimen of conventional IV amphotericin B (0.7-1 mg/kg daily) in conjunction with oral flucytosine (100 mg/kg daily) given for at least 2 weeks (or until the patient has stabilized) followed by at least 8-10 weeks of oral fluconazole (400 mg daily) or oral itraconazole (400 mg daily). Alternatively, the initial regimen of IV amphotericin B and oral flucytosine can be continued for 6-10 weeks. In patients with impaired renal function, doses and/or frequency of administration of flucytosine must be modified in response to the degree of impairment, severity of the infection, susceptibility of the causative organism, and serum concentrations of the drug. Several methods of calculating flucytosine dosage for patients with impaired renal function have been proposed; however, for greater accuracy, dosage in these patients should be based on actual serum concentrations of the drug. Precise dosing is limited, since flucytosine is commercially available only as 250-mg and 500-mg capsules. Some clinicians recommend that the usual individual dose (12.5-37.5 mg/kg) be administered every 12 hours in patients with creatinine clearances of 20-40 mL/minute, every 24 hours in patients with creatinine clearances of 10-20 mL/minute, and every 24-48 hours or longer (as determined by serum drug concentrations) in patients with creatinine clearances of less than 10 mL/minute. Other clinicians have recommended that 12-35 mg/kg be administered at intervals equal to twice the half-life of the drug. In patients with creatinine clearances of less than 10 mL/minute, an initial loading dose (the usual individual dose) followed by 6-17.5 mg/kg administered at intervals equal to the half-life may be of particular value. In patients undergoing hemodialysis every 48-72 hours, doses of 20-50 mg/kg administered immediately after dialysis generally produce therapeutically effective and nontoxic peak and postdialysis serum drug concentrations. The most frequent adverse effects of flucytosine therapy appear to be related to the drug’s effect on rapidly proliferating tissues, particularly the bone marrow and lining of the GI tract. Moderate hypoplasia of bone marrow, resulting in anemia, leukopenia, pancytopenia, thrombocytopenia, or rarely agranulocytosis, may occur. Eosinophilia and aplastic anemia also have been reported. The risk of bone marrow toxicity appears to be increased with prolonged, high serum flucytosine concentrations (i.e., 100 mcg/mL or greater), particularly in patients with renal dysfunction, or during concomitant therapy with amphotericin B. Bone marrow toxicity can be irreversible and may lead to death in immunosuppressed patients. In addition to antiproliferative effects on the GI lining, adverse GI effects reported with flucytosine, which are sometimes severe, include anorexia, abdominal bloating, abdominal pain, diarrhea, dry mouth, duodenal ulcer, GI hemorrhage, nausea, vomiting, and ulcerative colitis. Elevations of serum alkaline phosphatase, AST (SGOT), ALT (SGPT), and bilirubin have been reported in patients receiving flucytosine. In one patient, abnormal lactic dehydrogenase concentrations and sulfobromophthalein retention were attributed to hepatic necrosis, possibly resulting from flucytosine therapy. Hepatic dysfunction and jaundice have been reported. Elevations of serum hepatic enzyme concentrations generally appear to be dose related and reversible. However, acute hepatic injury with possible fatal outcome has been reported in debilitated patients receiving flucytosine. Increased concentrations of BUN and serum creatinine have been reported in patients receiving flucytosine. Azotemia, crystalluria, and renal failure also have been reported. Adverse CNS effects that have been reported with flucytosine include confusion, hallucinations, psychosis, ataxia, hearing loss, headache, paresthesia, parkinsonism, seizures, peripheral neuropathy, vertigo, and sedation. An acute cerebellar syndrome with dysmetria and ataxia occurred in a patient receiving flucytosine concomitantly with amphotericin B. The syndrome resolved over the next 4 weeks following discontinuance of flucytosine, although mild dysmetria persisted. Rash, pruritus, urticaria, and photosensitivity have been reported with flucytosine. Allergic reactions and toxic epidermal necrolysis also have been reported. Anaphylaxis, manifested as diffuse erythema, pruritus, conjunctival injection, fever, abdominal pain, edema, tachycardia, and hypotension, has been reported in at least one patient with acquired immunodeficiency syndrome (AIDS) receiving flucytosine therapy. Anaphylaxis recurred following rechallenge with the drug. Other adverse effects that have been reported with flucytosine include fatigue, pyrexia, hypoglycemia, hypokalemia, weakness, dyspnea, cardiac arrest, mycocardial toxicity, ventricular dysfunction, respiratory arrest, and chest pain. Patients should be under close medical supervision during flucytosine therapy. Hematologic, renal, and hepatic function tests including frequent determinations of serum alkaline phosphatase, AST (SGOT), and ALT (SGPT) concentrations should be performed prior to and at frequent intervals during therapy. The drug should be given with extreme caution to patients with bone marrow depression or impaired renal function. In general, adverse effects occur more frequently in azotemic patients than in patients with normal renal function. Patients with a hematologic disease or patients who are receiving or have received radiation therapy or myelosuppressive drugs may be most prone to depression of bone marrow function by flucytosine. It has been recommended that frequent serum concentration determinations of the drug be performed in patients with impaired renal function, and probably in all patients, to maintain flucytosine concentrations in the range of 25-100 mcg/mL. Flucytosine is contraindicated in patients who are hypersensitive to the drug. Safety and efficacy of flucytosine in children have not been established. Flucytosine was not mutagenic in various in vitro studies using microbial (e.g., Salmonella typhimurium) test systems in the presence or absence of activating enzymes. In addition, there was no evidence of mutagenicity in repair assay systems. The carcinogenic potential of flucytosine has not been adequately studied to date. Although standard segment II studies have not been performed, flucytosine was shown to be teratogenic in rats. When flucytosine was given to rats at dosages of 40 mg/kg daily (i.e., 0.27 times the maximum human dosage), vertebral fusions occurred; at dosages of 700 mg/kg daily (i.e., 4.7 times the maximum human dosage), cleft lip and palate and micrognathia were reported. In mice, flucytosine dosages of 400 mg/kg daily (i.e., 2.7 times the maximum human dosage) were associated with a low incidence of cleft palate that was not statistically significant. Flucytosine was not teratogenic in rabbits when given in dosages up to 100 mg/kg daily (i.e., 0.68 times the maximum human dosage). There are no adequate or controlled studies to date using flucytosine in pregnant women, and the drug should be used during pregnancy only when the potential benefits justify the possible risks to the fetus. The effects of flucytosine on fertility or reproductive performance have not been adequately studied in animals. It is not known whether flucytosine is distributed into human milk. Because many drugs are distributed into human milk and because of the potential for serious adverse effects in nursing infants, a decision should be made whether to discontinue nursing or the drug, taking into account the importance of the drug to the mother. In some in vitro studies, the combination of flucytosine and amphotericin B resulted in synergistic inhibition of strains of Cryptococcus neoformans, Candida albicans, and Candida tropicalis. The suggested mechanism of this synergism is that the binding of amphotericin B to sterols in cell membranes increases the permeability of the cytoplasmic membrane, thus allowing greater penetration of flucytosine into the fungal cell. However, in a study evaluating the antifungal effects of the drugs in the presence of serum, the combination of amphotericin B and flucytosine was not additive or synergistic against C. albicans. There is some evidence that concomitant use of amphotericin B and flucytosine may increase the toxicity of flucytosine, possibly by increasing cellular uptake and/or by decreasing renal excretion of the drug. If flucytosine is used in conjunction with amphotericin B, especially in HIV-infected patients, serum flucytosine concentrations and blood cell counts should be carefully monitored. In addition, it has been suggested that flucytosine be initiated at a low dosage (i.e., 75-100 mg/kg) and subsequent dosage adjusted based on serum flucytosine concentrations. In in vitro studies, the combination of flucytosine and fluconazole or itraconazole was synergistic, additive, or indifferent against C. neoformans; there was no evidence of antagonism. The combination of fluconazole and flucytosine generally did not exert a synergistic effect against C. neoformans isolates that had fluconazole MICs of 8 mcg/mL or greater. Synergism also has been demonstrated when the combination of fluconazole and flucytosine was evaluated in vivo in a murine model of cryptococcal meningitis. It has been suggested that synergism between the drugs may occur because fluconazole damages the fungal cell membrane allowing greater intracellular penetration of flucytosine. Norfloxacin may enhance the antifungal activity of antifungal agents (e.g., amphotericin B, flucytosine, ketoconazole, miconazole [systemic dosage forms are no longer commercially available in the US], nystatin). There are conflicting reports on this interaction, however, and in at least one in vitro study norfloxacin had no effect on the antifungal activity of amphotericin B. Further study is needed to evaluate the antifungal effect when norfloxacin is used in conjunction with an antifungal agent. Cytarabine reportedly antagonizes the antifungal activity of flucytosine, possibly by competitive inhibition. While flucytosine caused markedly false elevations in serum creatinine values measured using a 2-slide method on the Ektachem® analyzer, an alternative 1-slide method that is not affected by flucytosine is now available on the analyzer. Flucytosine does not affect serum creatinine values when the Jaffe reaction or other alkaline picrate method is used. Limited information is available on the acute toxicity of flucytosine. Although there have been no reports to date of intentional overdosage of flucytosine, overdosage would be expected to produce pronounced manifestations of the known adverse effects of the drug. Prolonged serum flucytosine concentrations greater than 100 mcg/mL may be associated with an increased incidence of toxicity, especially GI effects (diarrhea, nausea, vomiting), hematologic effects (leukopenia, thrombocytopenia), and hepatic effects (hepatitis). In the event of flucytosine overdosage, the manufacturer recommends prompt use of gastric lavage or an emetic. Because flucytosine is eliminated essentially unchanged in urine, adequate fluid intake should be maintained and IV fluids given if necessary. Hematologic parameters should be assessed frequently and liver and kidney function carefully monitored. Appropriate symptomatic therapy should be instituted if indicated. The manufacturer suggests that consideration be given to the use of hemodialysis in the management of flucytosine overdosage since the procedure readily removes the drug in anuric patients. Flucytosine may be fungistatic or fungicidal in action depending on the concentration of the drug. Two possible mechanisms of action have been identified for flucytosine. Flucytosine appears to enter fungal cells via the action of fungal-specific cytosine permease. Inside the cell, flucytosine is converted into fluorouracil (5-FU) by cytosine deaminase and then after several intermediate steps is converted into 5-fluorouridine triphosphate (FUTP). FUTP is incorporated into fungal RNA and interferes with protein synthesis. Flucytosine also appears to be converted to 5-fluorodeoxyuridine monophosphate, which noncompetitively inhibits thymidylate synthetase and interferes with DNA synthesis. Flucytosine does not appear to have antineoplastic activity. Flucytosine is active in vitro and in vivo against some strains of Candida and Cryptococcus. Limited studies demonstrate in vitro activity against some strains of Sporothrix schenckii, Aspergillus, Cladosporium, Exophiala, and Phialophora. Flucytosine has little or no activity against Coccidioides immitis, Paracoccidioides brasiliensis, Histoplasma capsulatum, Blastomyces dermatitidis, Madurella species, phycomycetes, dermatophytes, or bacteria. Optimal methods for antifungal agent in vitro susceptibility testing have been difficult to identify and are still being investigated. The National Committee for Clinical Laboratory Standards (NCCLS) has recommended standardized procedures for reference broth dilution antifungal susceptibility testing that can be used to test in vitro susceptibility of yeasts (e.g., Candida, Cryptococcus neoformans) to flucytosine and has established interpretive MIC guidelines for Candida based principally on historical data and partially on the pharmacokinetics of the drug. Interpretive guidelines are not available for other organisms, including Cryptococcus. While routine antifungal agent in vitro susceptibility testing is not recommended, such testing may be warranted under certain circumstances. When the NCCLS reference broth dilution procedure is used to evaluate susceptibility to flucytosine, Candida with MICs of 4 mcg/mL or less should be considered susceptible to flucytosine, those with MICs of 8-16 mcg/mL should be considered to have intermediate susceptibility, and those with MICs of 32 mcg/mL or greater should be considered resistant to the drug. Flucytosine is active in vitro against some strains of C. albicans, C. glabrata (formerly Torulopsis glabrata), C. parapsilosis, and C. tropicalis. In vitro, susceptible strains of Candida generally are inhibited by flucytosine concentrations of 4 mcg/mL or less. When the NCCLS standardized procedure was used to test in vitro susceptibility of clinical isolates of Candida obtained from neutropenic patients, the MIC90 of flucytosine was 0.25 mcg/mL for C. parapsilosis, 1 mcg/mL for C. albicans or C. tropicalis, and 4 mcg/mL for C. glabrata. Although some strains of C. lusitaniae may be susceptible in vitro to flucytosine concentrations of 4 mcg/mL, most strains of the organism are resistant to the drug. Susceptible strains of Cryptococcus neoformans generally are inhibited in vitro by flucytosine concentrations of 0.03-8 mcg/mL. When the NCCLS standardized procedure was used to test in vitro susceptibility of clinical isolates of C. neoformans obtained from neutropenic patients, the MIC90 of flucytosine was 8 mcg/mL. Aspergillus generally are resistant to flucytosine but rare strains may be inhibited in vitro by flucytosine concentrations of 3.9 mcg/mL or less. Sporothrix species are inhibited by 0.6-2 mcg/mL, Cladosporium species by 0.4-12.5 mcg/mL, and Phialophora species by 3.1-6.25 mcg/mL. Some strains of Exophiala castellanii and E. spinifera are inhibited in vitro by flucytosine concentrations of 10 mcg/mL or less. Strains of Candida or Cryptococcus resistant to flucytosine have been isolated from patients who have never received the drug, and resistant strains of Candida, C. neoformans, or Cladosporium have emerged in patients receiving oral flucytosine alone or in conjunction with IV amphotericin B. While the reported incidence of flucytosine-resistant Candida has ranged from 4-15.% in some studies, up to about 50% of clinical isolates were resistant to the drug in other studies. Resistance in C. neoformans generally has been reported to range from 1-4%; however, in some institutions up to 24% of isolates may be resistant to flucytosine. Resistance to flucytosine may be related to mutations that affect the production of fungal enzymes (e.g., uridine monophosphate pyrophosphorylase, cytosine permease, cytosine deaminase) important to the mechanism of action of the drug. Resistance also may result from mutations that result in increased production of pyrimidines. Flucytosine is well absorbed (about 75-90%) from the GI tract. Food decreases the rate, but not the extent of absorption. In patients with normal renal function, peak serum flucytosine concentrations of 30-45 mcg/mL are reached within 6 hours following a single 2-g oral dose. After 4 days or more of flucytosine therapy, peak serum concentrations occur within 2 hours after a dose is given. Peak serum concentrations are higher, more prolonged, and reached more slowly in patients with impaired renal function; in anephric patients, peak serum concentrations may be 50% higher than those in patients with normal renal function. It has been recommended that steady-state serum flucytosine concentrations should be greater than 25 mcg/mL to prevent the emergence of resistant strains but should not exceed 100 mcg/mL to avoid toxic effects. Flucytosine is widely distributed into body tissues and fluids including liver, kidney, spleen, heart, aqueous humor, and bronchial secretions. It appears that CSF concentrations may range from 60-100% of serum concentrations of the drug. It is not known if flucytosine is distributed into milk. The apparent volume of distribution is about 0.68 L/kg in healthy adults and has ranged from 0.4-0. L/kg in patients with renal failure. At a concentration of 2-55 mcg/mL, flucytosine is approximately 2-4% bound to serum proteins. The elimination half-life of flucytosine has been variously reported to be 2.5-6 hours in patients with normal renal function, 6-14 hours in patients with creatinine clearances of 40 mL/minute, 12-15 hours in patients with creatinine clearances of 20 mL/minute, 21-27 hours in patients with creatinine clearances of 10 mL/minute, and 30-250 hours in patients with creatinine clearances less than 10 mL/minute; half-lives up to 1160 hours have been reported in a few patients with creatinine clearances less than 2 mL/minute. Some clinicians have suggested that the half-life of flucytosine in hours is approximately 5 or 6 times the serum creatinine concentration in mg/dL. Only minimal amounts of flucytosine are metabolized in humans. About 75-90% of an oral dose of flucytosine is excreted unchanged in the urine. Urinary concentrations of flucytosine are generally 10-100 times greater than serum concentrations, although urinary drug concentrations are much lower in patients with impaired renal function. In one study, patients with serum half-lives of 40-83 hours achieved urinary flucytosine concentrations of 42-500 mcg/mL within 24 hours after a single 2-g oral dose. Unabsorbed flucytosine is excreted unchanged in the feces. Flucytosine is readily removed by peritoneal dialysis or hemodialysis. Flucytosine, a synthetic antifungal agent, is a fluorinated pyrimidine analog structurally related to fluorouracil and floxuridine. Flucytosine occurs as a white to off-white, crystalline powder that is odorless or has a slight odor; the drug is sparingly soluble in water and slightly soluble in alcohol. The drug has pKas of 2.9 and 10.71. Flucytosine capsules should be stored in tight, light-resistant containers at a temperature less than 40°C, preferably at 15-30°C. The commercially available capsules have an expiration date of 5 years following the date of manufacture.